We don’t love to budget but it's a very necessary part of family life. The New Year is a chance to take a look at your finances and see where you could be making new savings. Food and drinks are two areas where you’ll always need to spend but there are some simple ways that, if you make them habits, could save you time and money. And who couldn’t use a little more of both! Supermarkets, as helpful as they are, are businesses that love money and they make a lot of it on ‘premium’ and branded products. Most of the time these products are no better than their supermarket value counterparts: the packaging may look luxurious or more familiar, but crucially the profit margin is a lot higher. This makes more difference psychologically than it does to the taste or quality of your food (with most products). You may have seen that programme where Greg Wallace and Chris Bevan stalk families in supermarkets and then radically transforms their shopping bills. By swapping their groceries for cheaper brands and supermarket basics these families end up saving hundreds of pounds per month. They rarely ‘taste the difference’ between their usual products and the substitutions. You don’t have to trade everything either, just swapping a few items here and there is a great place to start. 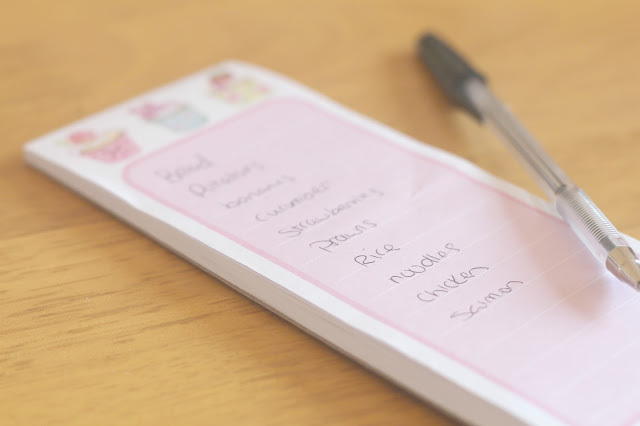 Don’t let the power of marketing stand between you and your savings, and don’t forget your shopping list! Whether it’s a flat white, an americano or a strong cup of tea, statistics suggest that our caffeine habit has got out of hand. While you may need a coffee to be able to drive to work safely or before you pick the kids up from school, café chain coffee is sold at extortionate prices. Barista style coffee is a real treat, and occasionally a necessity to get you through the day. But, as this blog post by Mahahome points out, you could save over £600 per year by making your coffee at home rather than stopping off at Starbucks on your way to work. That saving is based on one flat white per day at an average of £2.53, but even filling up a thermos once a week could save you about £120 per year. Add it to the savings on your weekly shop and this year’s a bargain already. There’s nothing wrong with sending your kids to school with cheese and ham sandwiches, a cereal bar and a banana. But if you’re spending hundreds of pounds on healthy snacks and sandwich fillers every year, maybe you should consider the DIY options. Jelly for example, is a filling and delicious sweet treat. It’s full of energy and low in calories (especially compared to chocolate and cake bars). Jelly cubes are very cheap and make big batches that can be used throughout the week. Lunchtimes for little ones should be fun, so introducing new foods to their lunchboxes should be too. It’s hard to know what to feed your kids when you’re not there to supervise though. For children, there’s nothing worse than opening a lunchbox to find something unknown, other than being ‘the kid with the smelly lunch’ (whatever you do, don’t give them fish!). But why not try sending them off with leftovers from the previous night’s dinner, so that they’re not stepping outside their comfort zone without your support? Pasta, rice, and noodle dishes are always great cold the next day and are cheaper, healthier and more filling than those branded snacks and sandwiches designed for lunch boxes. There is plenty more lunch box inspiration to be found on the BBC Goodfood website. 2015 was the year of the smoothie, or simply blending foods. Just look at the sales of Nutribullet style blenders: they rose by 272%. The truth is, smoothies are delicious and they’re great every now and then. But the great thing about eating raw, unblended fruit and veg is that it fills you up. If you eat an orange, you get plenty of vitamins and fibre and the sugar of one orange. If you blend three oranges, you still get plenty of vitamins and fibre, but you get three times the amount of sugar, and it’s already broken down so it’s more likely to be stored in the body as fat. On top of that, evidence suggests you’re more likely to consume more calories afterwards, because a liquified food won’t satisfy your appetite as well as a solid meal or snack. So, although smoothies are a great way of getting your five-a-day, they aren’t quite as healthy as many people would claim. There’s also nothing wrong with following trends and innovative food tech. Just make sure you do your research first. P.s. ‘Superfoods’ don’t exist. Happy New Year. Nice tips. you shared very informative post.